What do you get when you mix a dash of pop with a dash of classic piano rock? You get the magic that is insanely talented French synthpop newcomer Christine and the Queens performing with the man, the myth, the Rock and Roll Hall of Famer that is Sir Elton John. Naturally, when we caught word of this dazzling collaboration that happened yesterday at London's Apple Music Festival, our jaws collectively hit the floor. The pair took to the stage to perform (and bless our souls with) two duets of their hit songs, respectively "Tiny Dancer", and "Tilted". And yes, it awesome. 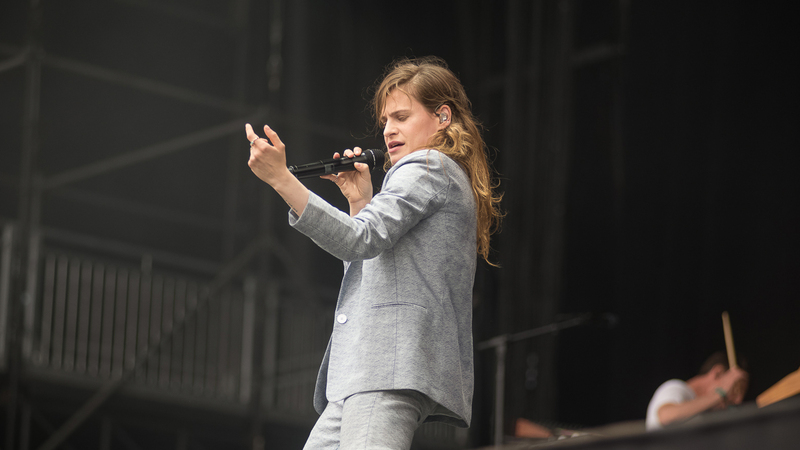 The two kicked off the set with an intimate rendition of Elton John’s 1971 hit "Tiny Dancer" with Sir in his usual spot at the grand piano while beautifully harmonizing with Christine and the Queens, who took center stage and hit all the notes effortlessly. Fans thought they were already in for a major treat when the two took the stage together, but when the contemporary pop musician became her own version of a tiny dancer, the crowd was impressed yet again. Frontwoman Héloïse Letissier brought the crowd back to the era of modern pop music with her hit single "Tilted", where she showcased her dancing skills. The singer-songwriter shimmied across the Apple stage and showed off her infectious, contemporary dance moves with four male back-up dancers, making fans bust a move right along with them. In the videos, you can hear Sir Elton singing along to the catchy chorus in unison with the songstress to the side of the stage. The entire experience was nothing short of special, and that genre mixing magic only happens when some of the biggest and brightest names in pop music join forces on the Apple Music Festival stage. We don’t know about you, but next year we're hopping on the next direct flight to London so we don't miss an experience like this. Hope to see you there!